Hi everyone! Time for the Friendly Fill-Ins. Please leave your link (at bottom of post) here or at my co-host’s Four-Legged Furballs. You can also answer in the comment section. Thank you to all who participate. Don’t forget to add your link to the hop so everyone can visit you. 1. The highlight of my week is watching The Blacklist on Friday night. James Spader is such an amazing actor. My hubby and I recently binge watched Boston Legal and he was great in that too. Don’t worry Nic Cage, my heart still belongs to you. ( And yes, I heard about his recent 4 day marriage). 2. Only 16 more days until I can have chocolate again. ( I gave it up for Lent). 3. I believe I was born to rescue cats. 4. Age is only a number. I am going to be 50 this year, but in my head , I am about 10. 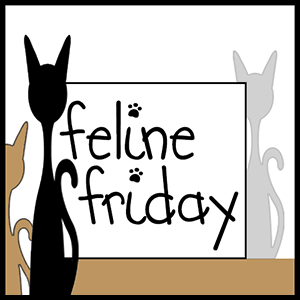 We are also joining Create With Joy’s Friendship Friday and Feline Friday currently hosted by Comedy Plus. We are also joining FiveSibes Flashback Friday. Here are some more photos of past Catburry Bunny auditions. My angel Lucy in a different set of bunny ears. I know this is a long post, but I still need to do The A-Z Blogging Challenge, letter E. E is for emails. If you like a brand of cat food, litter, toy, etc.you should sign up for emails from their website. Most of the time they will send special offers to you for sales on their products. This entry was posted in A-Z Blog Challenge, Blog Hops, Friendly Fill-Ins and tagged Feline Friday, fivesibes Flashback Friday, friendly fill-ins blog hop, friendship friday blog hop, Lucy, Spooky by pilch92. Bookmark the permalink. Great fill ins! We love the Bunny ear photos of the angels! Inside, i think we are all about ten. Those are sweet photos of your Angels in bunny ears. Congratulations on #2 of your fill ins. I think I would go crazy without my chocolate fix for that length of time. We started watching The Blacklist but got sidetracked and have yet to return to the show. We’ll pick it up again, as we’re streaming it from Netflix. You were definitely born to rescue kitties and I know they love you for it or at least they pretend that they do. You never know with cats. lol Lucy and Angel need to try out for the Cadbury Easter egg commercial. How cute! I’m joining the FFF in. Thanks for hosting the fun! Join me today for a look at myA2Z The Little Mermaid art sketch ‘Eric’. Happy a2zing! I think 10 is a great age! It’s good to feel like a kid! I believe you were born to rescue cats, too! 1. The highlight of my week is walking on the beach. 2. Only two more days until Sunday. I love our special Sunday dinners! 3. I believe I was born to live near the ocean. 4. Age is only an issue as we get older. Getting old takes courage. I love James Spader! Boston Legal and now The Blacklist are two of my favorite shows. We have similar answers to #3 and #4. Great answers to the fill-ins. We like those two programs too. And the angels sure look good in their hats. Have a super day. Such fun bunnies! Great answers too and we always watch Blacklist. Love all your fill-in answers. I’m going to be 68 this year. You’re very young. Love all your kitties and all their bunny ears. You so enjoy your kitties and it shows. Thank you for joining the Feline Friday Blog Hop. Bunny Angels…..love that. You ABSOLUTELY were born to be a cat rescuer….and you do a wonderful job of it too. Such lucky kitties to be in the Pilch household. Happy Friday!! Great fill-ins. I am right there with you on the age thing. I am older than you are so in my head, I am 15. 🙂 Love your kitties bunny ears. So cute. Dear me you are just a youngster not even 50 yet, my daughter is 47. My peeps could never, ever give up chocolate. HAH! TW says age is just a number until you start waking up in the mornings feeling like you were run over by a truck—every morning. Our mom is older than you, and she acts like a kid. She says you’re only as old as you feel! You were definitely born to rescue kitties and you are so wonderful doing that! My mom just told me she started watching Boston Legal, too. It is a great show. I agree so much about the age thing! I am almost 48, but I can have fun like a child. And that’s a good thing! Thank you. I hope you have a nice weekend too. Poor Nicholas Cage; he just cannot catch a break in his love life! He should stick to his beloved cats, then he’ll never be in divorce court again. He and his brother are both catmen! I knew you knew about Nic’s marriage. 🙂 He’s a fascinating man, but clearly has issues. James Spader is an amazing actor. And yes, you were totally born to rescue cats. My dad watches the Blacklist. Mom doesn’t like those loud shows where people are always getting hurt. #3 Yes! And you are amazing at it. I liked your fill-ins, I feel like i’m ten in my head too sometimes heheh! Sweet photos! And nice fill-ins. Be well, my dear. Such cute bunnies! My answers to 3 and 4 are much the same. I felt the same way as you when I was 50; but now that I’m pushing 60, I think I’m feeling my age more! Oh, The Blacklist is an amazing show. I used to watch it, but these days I barely watch any TV at all. I really should pick that show back up. And I share the exact same sentiment regarding age. It’s just a silly number. Your adorable Catburry bunnies are one of my favorite parts of Easter! Angels Lucy and Spooky sure were purrfect bunnies. You should binge watch Blacklist, the past two years were really good.